We were one of the last groups of campers to arrive. After checking in at the office we were escorted, via golf cart, to the campfire where the rest of our group was waiting. The sun was nearly set and the light from the campfire bounced off the surrounding trees. A cowboy was sitting on one of the benches surrounding the fire, tuning his guitar. A few kids were making s’mores, while others were drumming up good ghost stories to share. Soon there would be singing and even an impromptu karaoke by one of the campers who loves singing Patsy Cline songs. The campfire set-up was perfect for our group; there was plenty of space for the adaptive equipment and wheelchairs that several of our members used. 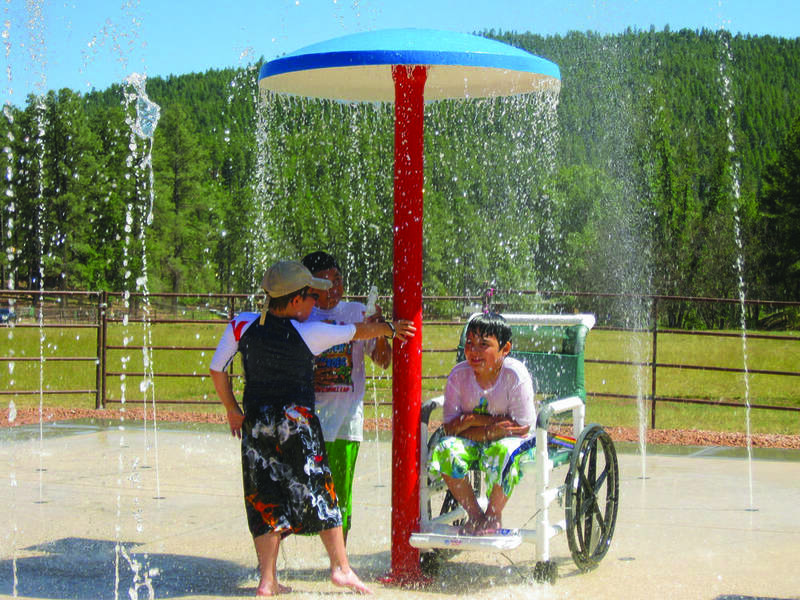 Whispering Hope Ranch (WHR), a 45-acre sanctuary outside of Payson was built for groups just like ours. We were a hodgepodge of families, many of whom had children with disabilities, lots of siblings without disabilities, volunteers and friends. We all came together to enjoy the great outdoors. 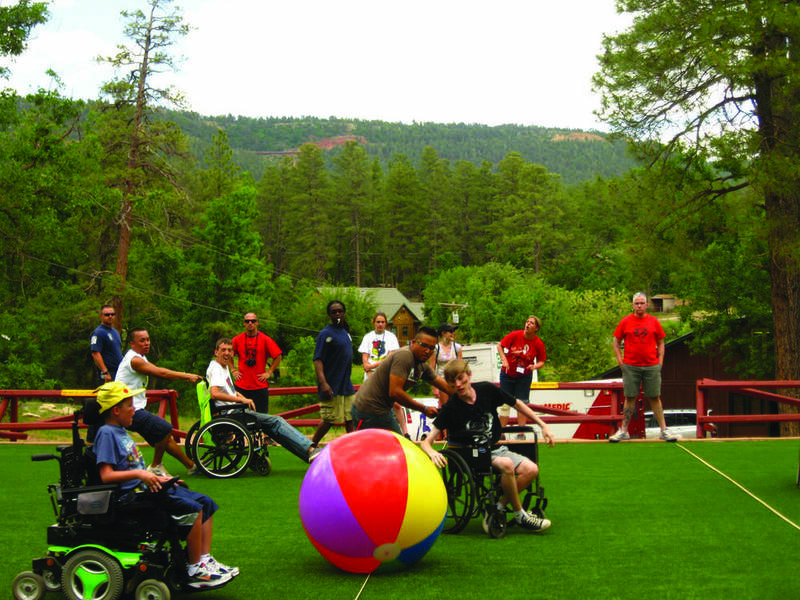 A person unfamiliar with disability and accessibility, might look around and see a typical rustic camp. Simple yet beautiful cabins with large spacious rooms, walk-in showers and large porches. There are well-manicured walk ways throughout the camp and lots of pine trees. They have a large meadow, spring-fed pond, creek and antique fruit trees. 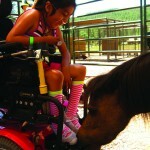 The ranch, also an animal rescue, provides a home to more than sixty animals, most of whom have physical disabilities or have suffered trauma. 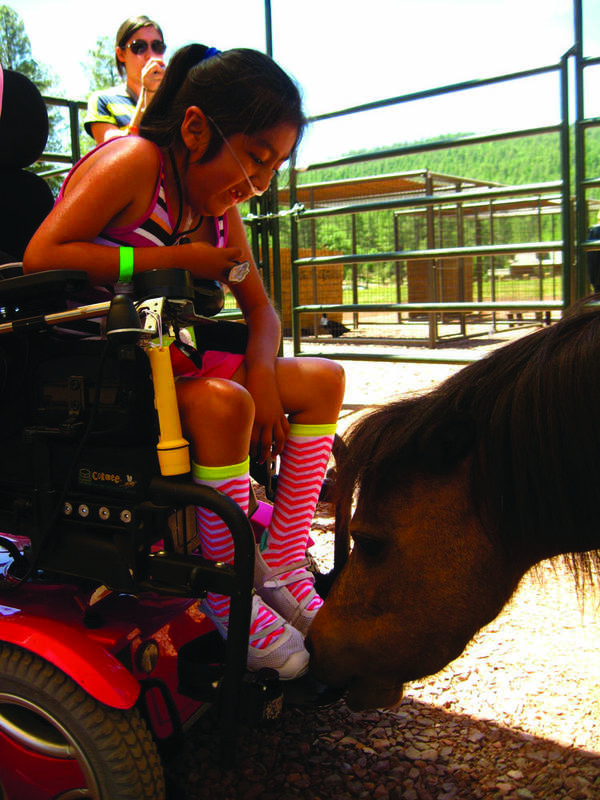 The heart of the Whispering Hope experience lies in the healing bond that grows between their campers and these gentle animals. 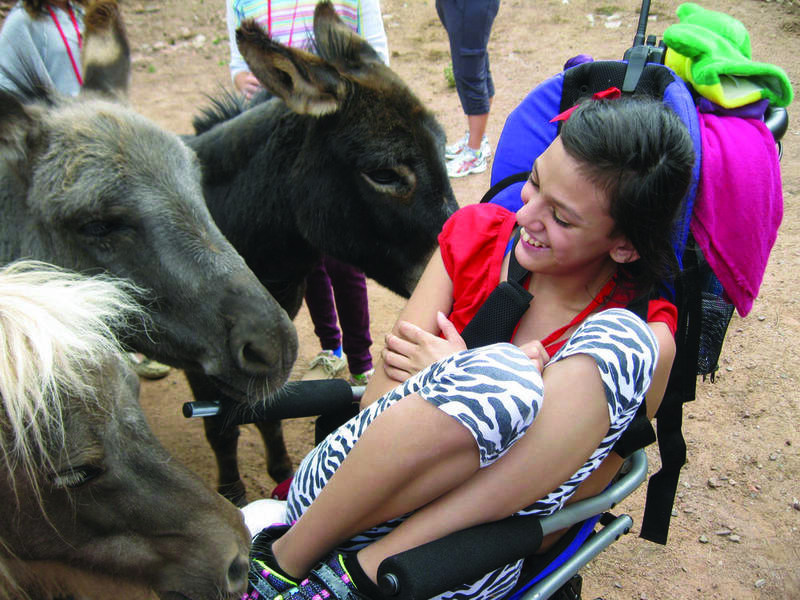 They have a new fully accessible Center for Human-Animal Interaction so that children with mobility challenges can spend time with the animals. “People are building memories that not only sustain them until their next visit, but are cherished for a lifetime,” says Clark. During our stay we built bird houses and horse shoe art, learned archery, rode horses, enjoyed the playground and played sports. We had a movie night under the stars, cuddled up in blankets while munching on popcorn and candy. 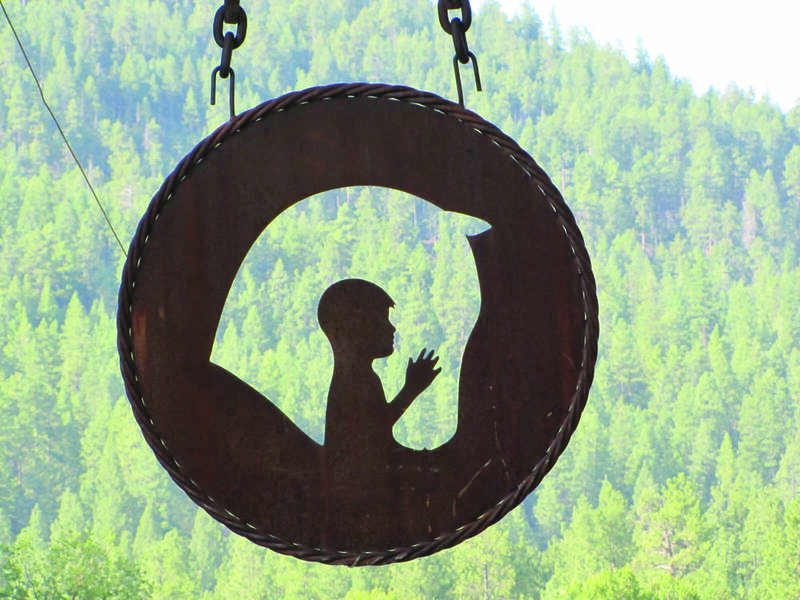 We ate our meals under a ramada, while listening to the wildlife chatter all around. Then visited with the animals, including deer, ducks, llamas, goats and horses. Although there were a lot of activities available, there was also flexibility and time to relax. One of my favorite activities was playing in the creek and looking for crawdads. This was a big deal for the kids and their parents, as wheelchairs were left behind and kids sat at the edge of the creek giggling and squealing as they caught crawdads with their buckets, shovels and bare hands. Today, there are more accessible features since my visit. 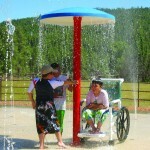 They now have a splash pad for the kids to cool off during the summer, complete with water wheelchairs. There’s an accessible playfield with synthetic turf that can withstand significantly more use than natural grass, and reduces dust aiding those with respiratory issues. The field is used for soccer, basketball and even adaptive bicycle races. This year they are adding a wheelchair platform swing to their playground. Some volunteers help with the campers, while others help from afar by putting together craft projects, like donkey shaped no-sew pillow kits. When camp isn’t in session, they welcome large volunteer groups to help with projects. Volunteering at WHR is a great way to get out of the heat, while doing something that makes a difference in someone’s life. 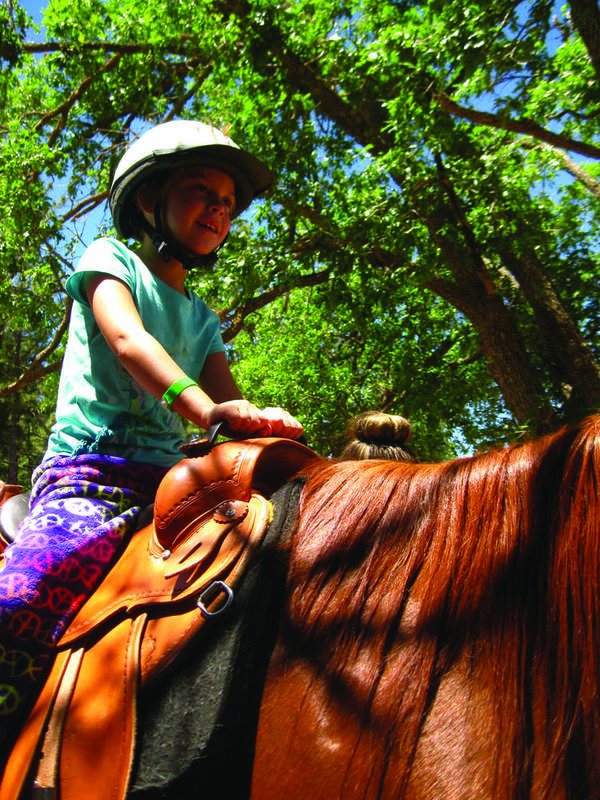 The ranch is supported entirely by private donations. They charge their guests a modest fee, but 75-80% of the costs is covered by the WHR Foundation. One of WHR’s guiding principles is that hope is an essential element for healing. 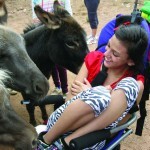 Healing might come as a parent observes their child smile when a miniature donkey breathes their own special magic on the arm of a nonverbal child. Perhaps someone who’s lost a loved one finally finds a place to breathe, and people to relate too. Maybe a little girl who uses a wheelchair, meets another little girl who uses one too, and they spend an afternoon splashing in the water on a warm summer day. 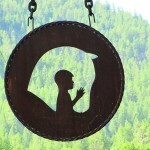 Hope and healing comes in many forms, often whispering into one’s soul as they find a place of peace. 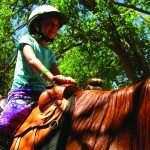 Learn more about partnering or volunteering with Whispering Hope Ranch Foundation by visiting whisperinghoperanch.org.